Heritage Line is a consummate collector of classic river vessels. We design our ships to emulate the glories of a by-gone era in the areas we sail. Each is unique in its décor and setting. Each detail is painstakingly crafted to remake history. 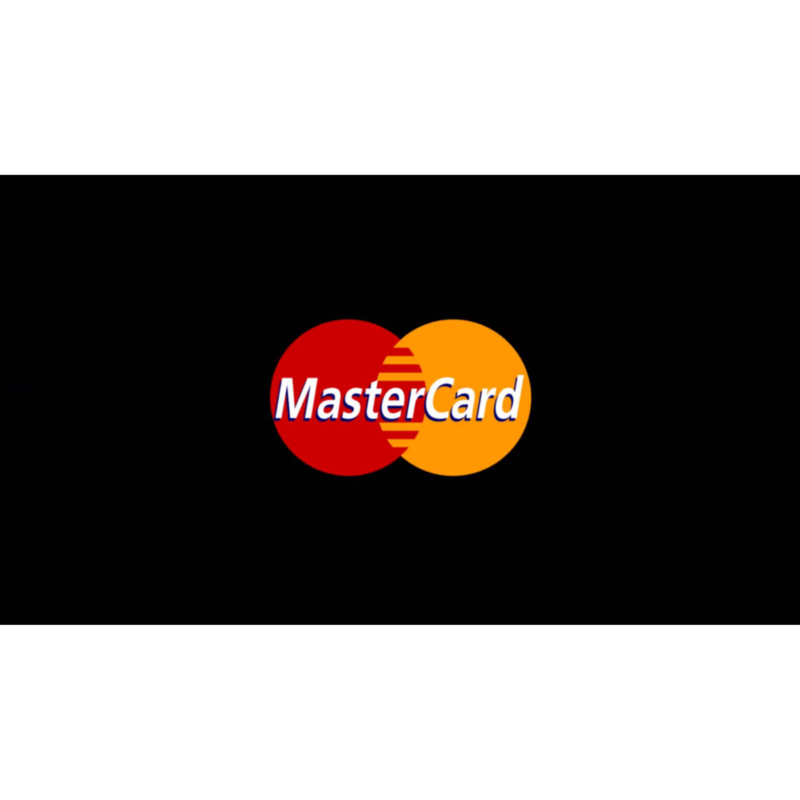 Authenticity, tradition, art and exploration are the heart of our business. 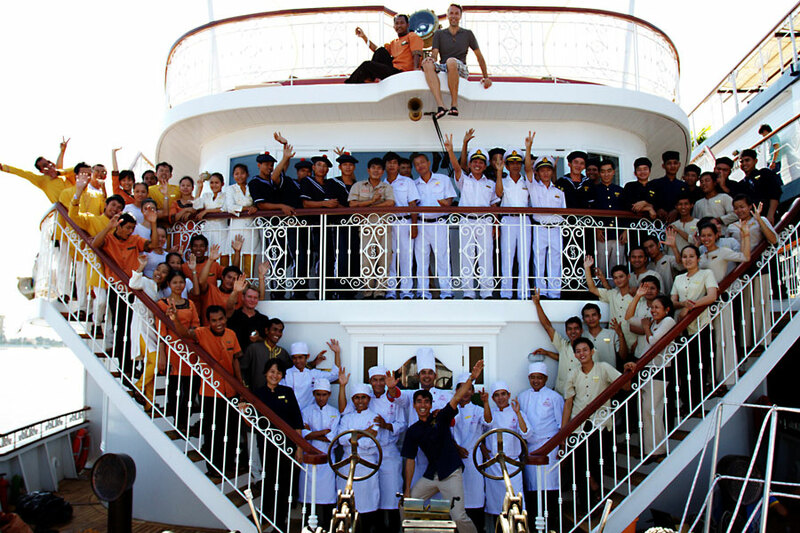 Considered the father of our ship fleet on the Mekong, the Jayavarman was inspired by a French-Colonial cruise liner. It charms guests with its artful ambience, pastel coloured cabins and quaint wooden bar. It has intricate woodcarvings, Khmer bas-reliefs and Vietnamese lacquer paintings resembling a floating art gallery. Anawrahta sails the Ayeyarwady and Chindwin Rivers in Myanmar and is built to resemble a British-Colonial paddle-steamer. The vessel features four spacious decks and 23 cabins and spacious suites, all come with private balcony. With its gleaming white rails, polished lacquer and intricately carved woodwork, the Anawrahta takes guests to an era of bygone elegance in sailing. Phnom Penh was once the Paris of the East. Despite its rapid development, it has retained a lot of its rustic charm and elegance. Sightseeing in the morning will include the Killing Field outside town. Be prepared to be heart wrenched by this stark reminder of the genocide that transpired during Cambodia’s Khmer Rouge regime. Before lunch at a local restaurant, we will visit the Genocide Museum, see the dazzling white and gold edifice of the Royal Palace and the Silver Pagoda, and witness exceptionally beautiful Khmer craft at the National Museum. We go back to the Ship by “cyclo” – traditional vehicle after our museum visit. 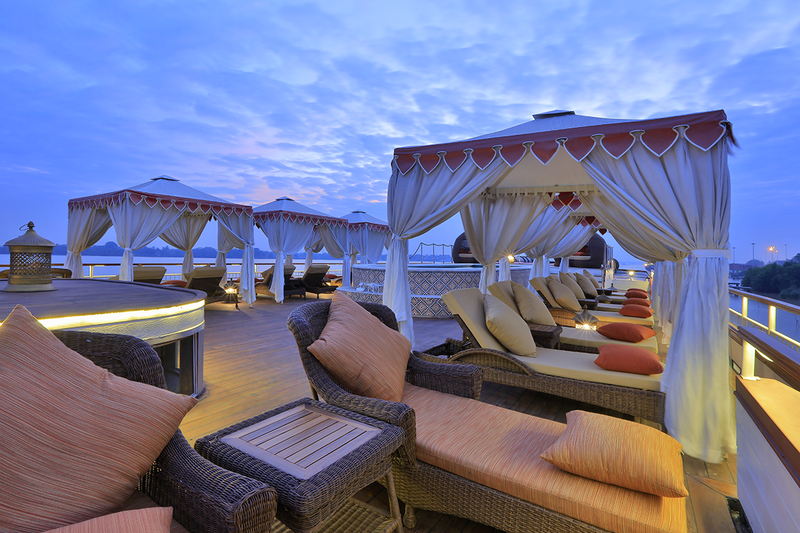 Take a rest on your cabin balcony or the lounge and get prepared for an exciting evening event. The evening starts with a variety of cocktails served on the Sundeck. In late afternoon, we will be captivated by a comprehensive lecture on Cambodia’s modern history. BBQ dinner is served right after the lecture. Take a seat and enjoy the Apsara dance performance. Experience the brilliance and richness of this culture, the soothing sounds of traditional music, the calming scent of incense sticks and a barbeque on the sun deck. It is indeed a truly marvelous experience, dining in the open with the moon and the starts as our companions. Lunch and dinner are included. Overnight in Phnom Penh. We will depart before the break of dawn from Phnom Penh with a stop at the little known Silk island community. 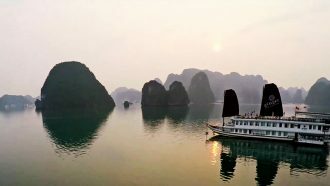 We will then return to the Ship and pass by the Mekong’s tranquil villages, exhilarating river life and sun-hardened fishermen on their shift boats. We will tour the rural Angkor Ban village where time stand still. We are transported back a hundred years into an era unaffected by modernity. The houses here are truly rustic, made by hand and without any concrete. But most of all, we feel overwhelmed by the unbridled warmth of the villagers. Travelers can take part in the daily activities of the villagers to experience village life first hand. Then, we are back to the Ship to cruise towards Kampong Cham. Breakfast, lunch and dinner are included. Overnight in Kampong Cham. We will wake up in the early morning, truly energized to embark on a land journey to the pre-Angkorian temple of Wat Hanchey. Travelers either take a motor-taxi or climb 303 steps to the top. Located at the top of a hill overlooking the river, it offers one of the most breath-taking views in Cambodia. Built in the 8th century, this ancient structure, together with a bigger and newer addition underscores the superb architecture of the Chenla Empire which predates the mighty Angkor temple complex. We even get to engage in light banter with some of the monks in the area. We will return to the Ship to witness a blessing ceremony performed by orange-clad local monks. Lunch on board. We will then cruise towards Kampong Cham to visit Wat Nokor, a Wat built within the ruins of an ancient temple which holds a timeless story. Visit OBT project of Heritage Line and organization for Basic Training. Breakfast, lunch and dinner are included. Overnight in Kampong Cham. 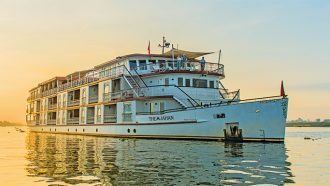 Before the sun peeks over the horizon, the cruiser sets sail towards Kampong Chhnang on the Tonle River – an amazingly narrow river – which glides through leafy swaths of the Southeast Asian jungle. We are greeted by cacophonous children who waive enthusiastically early in the morning when they bring their livestock for a bath in the meandering Tonle River. Then we approach Kampong Chhnang, Cambodia’s “Water World” where everything is on stilts balanced on water rich soil– it’s an awesome sight whilst practicing Tai Chi on the deck. Here we take a minivan to see the Khmer-styled pottery at the Aundaung Russey village. Then, it is back to the river for an adventurous motorboat excursion to the wetlands, floating houses and fish farms in the region. The village has no electricity and has around 600 inhabitants. We then return to the Ship for lunch while cruising the narrow and meandering Tonle Sap River. 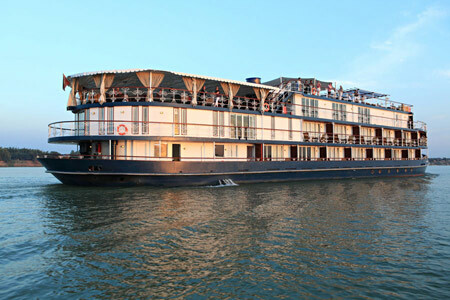 Your floating sanctuary will then cruise gently, in the afternoon, along the narrow and meandering Tonle Sap Lake. In the evening, a sumptuous spread will be served. And for the big entertainment – bring along your dance shoes and learn to jiggle the Cambodian way with our staff doubling up as dance instructors. (If you can’t dance, do not fret. Neither can our staff) Breakfast, lunch and dinner are included. Overnight in the middle of Tonle Sap Lake. The Tonle Sap (The Great Lake) is the flowing heart of Cambodia, giving love and life to this nation. The Tonle Sap has more fish than any other lake in the world and is home to an incredible variety of birds, including rare – and endangered – feathered life. This great lake dominates Cambodia and is the largest freshwater lake in Asia with abundant birdlife. This lake is so wide that one cannot see its shores from the middle of the lake. Enjoy the stillness of the water and the quiet tranquility on the way to Siem Reap. The water level varies a great deal according to the time of the year and the amount of rainfall recorded. Thus, minor changes to the itinerary may occur during different seasons. Our Heritage Line cruise liner comes to an end as we reach this city of the fabled Angkor temple complex. We bid farewell to the cruise as our journey comes to an end. But the memories and the friendships made on board linger on for a lot longer. 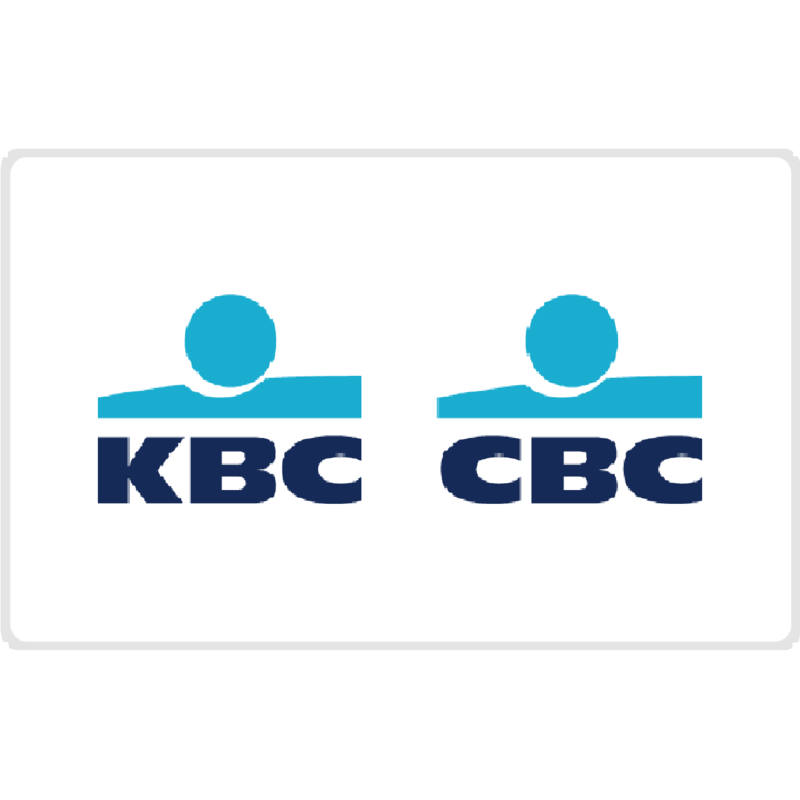 We will cross the Tonle Lake at dawn and at 09:00am, we will disembark at the Siem Reap Port for onward coach transfer to the drop off point in town. Breakfast is included. A mysterious body of water. Flowing through six countries in Asia. Giving love and life to millions. Received its fame by the legendary God King of ancient Cambodia, King Jayavarman VII, who linked hands with the waters of the Mekong to build the magnificent Angkor civilization. The best of rural Cambodia offers green landscapes, ancient temples and smiling faces – all off the beaten track. 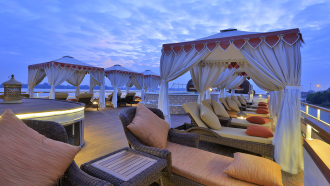 4 nights Phnom Penh – Siem Reap (or vice versa), 3 nights cruise is also available. Vietnam and Cambodia play the role of muse to any artist. There is so much to inspire. Whether it’s the steam and aroma wafting from a street stall in Vietnam, being tenderly stirred by an elderly woman in a conical hat, who has done so for decades on the same corner. Or, the breathtaking, slightly intimidating presence of Angkor Wat and the unbelievable feats of men and incredible stories of an ancient time; this region is rich in interest. The food, scenery, architecture and culture of this region inspire at every turn, and looks back at you through the smiles of its people. 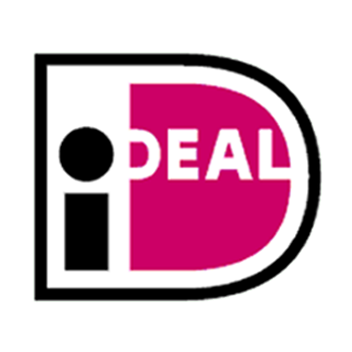 *Upstream and Downstream itineraries available – this indicates the direction the ship will travel. 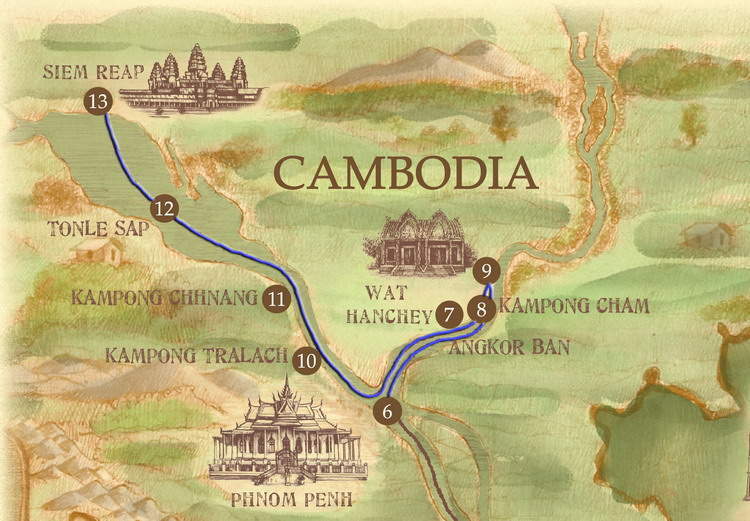 Downstream means from Siem Reap to Phnom Penh. Upstream is the opposite direction from Phnom Penh to Siem Reap. 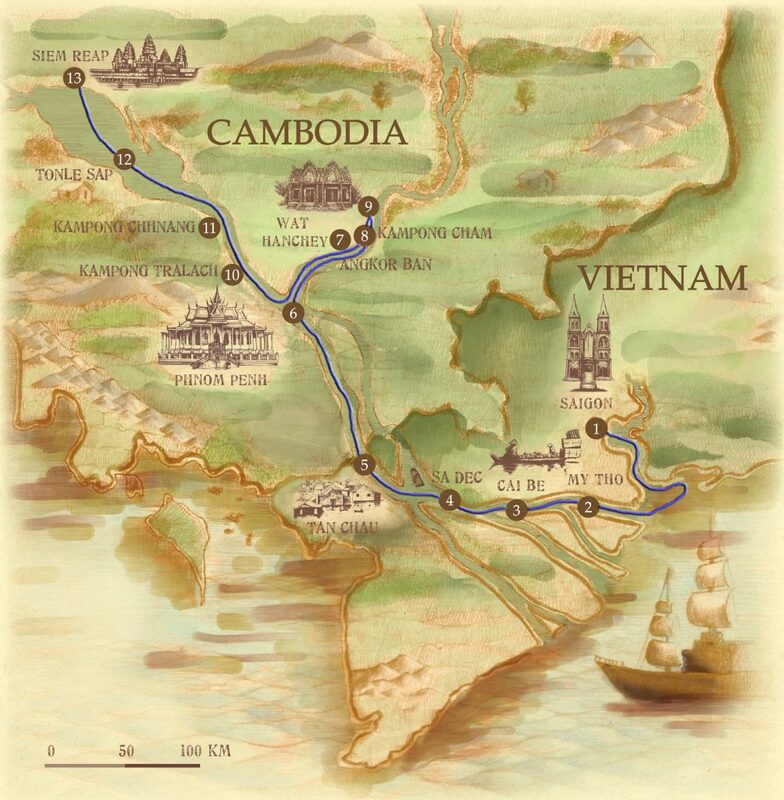 Please Note: More Mekong voyages are available (upstream/downstream), not all of them are listed online. Please contact us for more details. 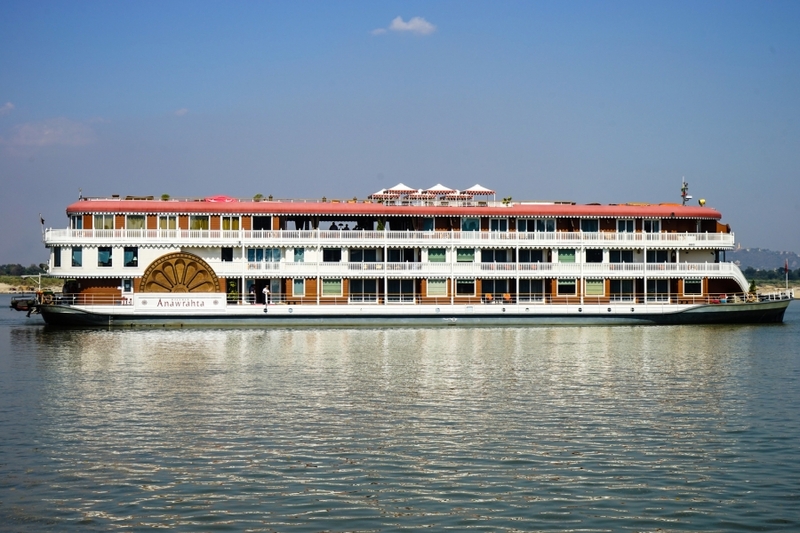 The Jahan is Heritage Line's most romantic cruise liner. Plying the slow, swirling waters of the Mekong, The Jahan is Heritage Line’s most romantic cruise liner. Considered the brother of The Jayavarman in Heritage Line’s “family” of cruise ships, this magnificent vessel was named after the Indian emperor Shah Jahan, who ruled the Mughal Empire from 1628 to 1658. A great patron of architecture and the arts, Shah Jahan oversaw the construction of many legendary sites, including India’s dazzling Red Fort, and the famed 777 gardens of Kashmir. 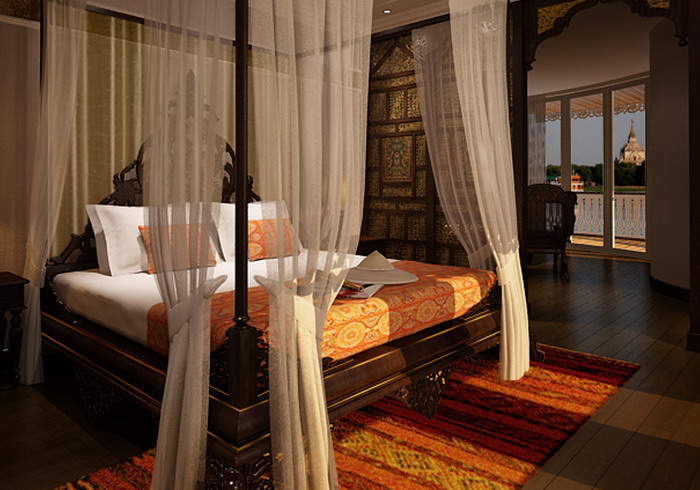 This cultured monarch is a fitting namesake for The Jahan, which evokes the opulent vessels of British India. No expense has been spared in the interior or exterior decorations, which showcase the talents of local woodworkers, weavers and artists. When guests aren’t relaxing in their luxurious cabins they can meet friends in the atmospheric East India Club; soak in the Jacuzzi on the Pool Deck; challenge a new friend to a game of chess in the Observatory Lounge; or enjoy a pampering massage in the Apsara Spa. 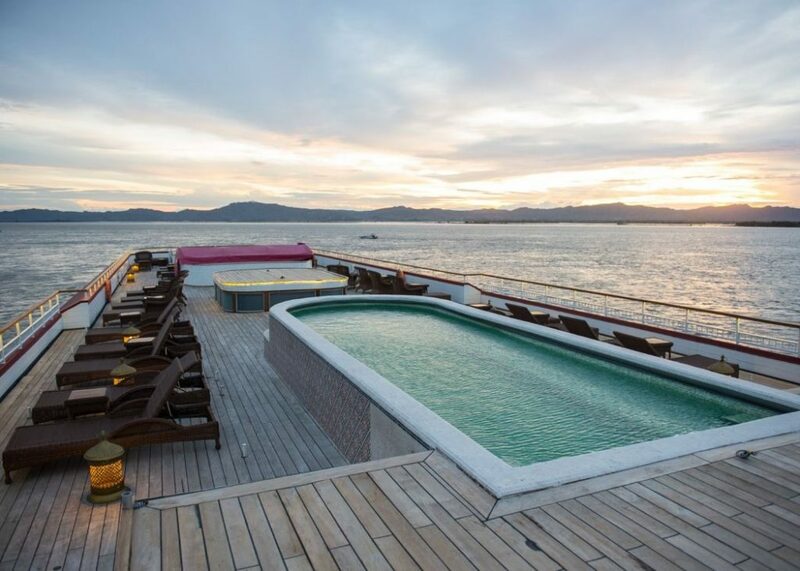 With three decks, this vessel offers all the amenities of a fine resort, including a fitness center, steam rooms, a range of dining venues and an excellent spa. Stretching 70 meters/230 feet from bow to stern, The Jahan features 26 beautifully-designed cabins on two decks, each with its own private balcony. 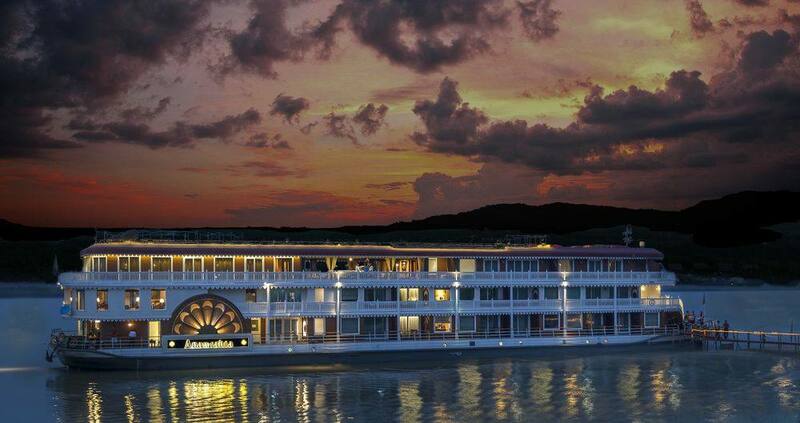 Discover the bygone elegance of travel aboard the majestic Jahan. Just as Indian art and architecture influenced the Khmer and Cham cultures in the Mekong Delta, the stunning artistry of The Jahan will inspire you, as will the delta’s vibrant beauty. Bid farewell to the hustle and bustle of Saigon as we travel 70 kilometers south by land to My Tho to embark your boutique Ship. 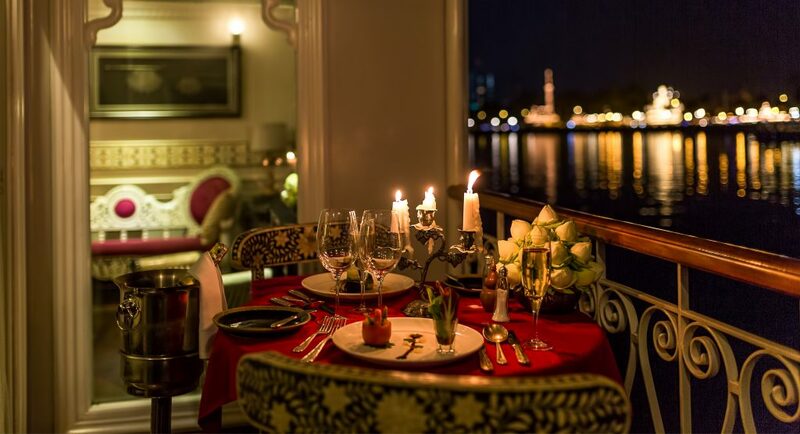 We will be served refreshing drinks and light lunch as the Ship steadily glides along the Mekong. We will bathe in the fading sunset on the balcony followed by a briefing at the lounge. Later, a welcome dinner awaits us. When approaching Cai Be, the Ship drops anchor midstream. Light lunch, afternoon tea and dinner are included. Overnight in Cai Be. Every day, our journey starts with an invigorating Tai Chi lesson on the Sundeck just as the sun begins its gentle glow. Coffee and tea awaits the early bird. The day-tour starts with a visit to Cai Be’s boisterous and colourful floating market on a traditional sampan (a flat bottomed traditional Vietnamese wooden boat). During the ride, discover breathtaking landscapes along the river and quaff the rustic life on the Mekong Delta. 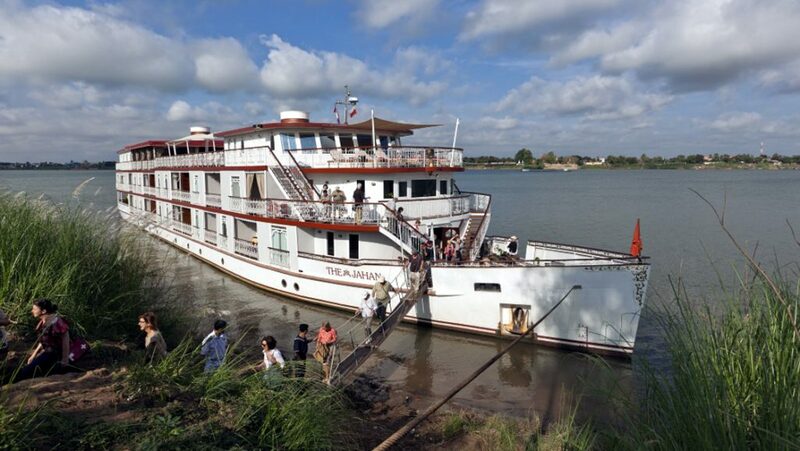 The cruise will halt intermittently to allow us to observe how rice paste, rice paper, rice cookies, rice pop, rice wine and coconut candies are made, enjoy local life along the canals on the way back to the Ship for lunch. In the afternoon, we cruise to Sa Dec. Upon arrival, we embark a traditional sampan to tour Binh Thanh Island to visit an untouchable village. Here, every villager is involved in the process of making rattan mat and this give us the chance to interact with the old local people. We then board the Ship for a tranquil evening cruise towards Tan Chau. Breakfast, lunch and dinner are included. The Ship will moor midstream overnight near Tan Chau. Welcome to the fish sanctuary of Vietnam. Begin your day with a hearty breakfast at the Dining Hall of your balcony. Brace yourself for a short excursion in Tan Chau, a pleasant town near the Cambodian border with sizeable Chinese, Kinh and Khmer community. Firstly, the journey takes you to the “evergreen” islands where you will be thrilled to learn the life of the locals. The inhabitants of these islands live on houses poised on high stilts – a centuries-old tradition in this part of the Mekong Delta. We stop to visit a fish farm located in the Tan Chau canal – this farm consists of floating houses and the villagers make their living by cultivating fish. You continue by boat to Tan Chau pier, disembark here and stroll around this colourful local market with lots of regional products. You return to the cruise Ship after your market visit. Breakfast, lunch and dinner are included. Overnight we anchor midstream near Phnom Penh. Phnom Penh was once the Paris of the East. Despite its rapid development, it has retained a lot of its rustic charm and elegance. Sightseeing in the morning will include the Killing Field outside town. Be prepared to be heart wrenched by this stark reminder of the genocide that transpired during Cambodia’s Khmer Rouge regime. Before lunch at a local restaurant, we will visit the Genocide Museum, see the dazzling white and gold edifice of the Royal Palace and the Silver Pagoda, and witness exceptionally beautiful Khmer craft at the National Museum. We go back to the Ship by “cyclo” – traditional vehicle after our museum visit. 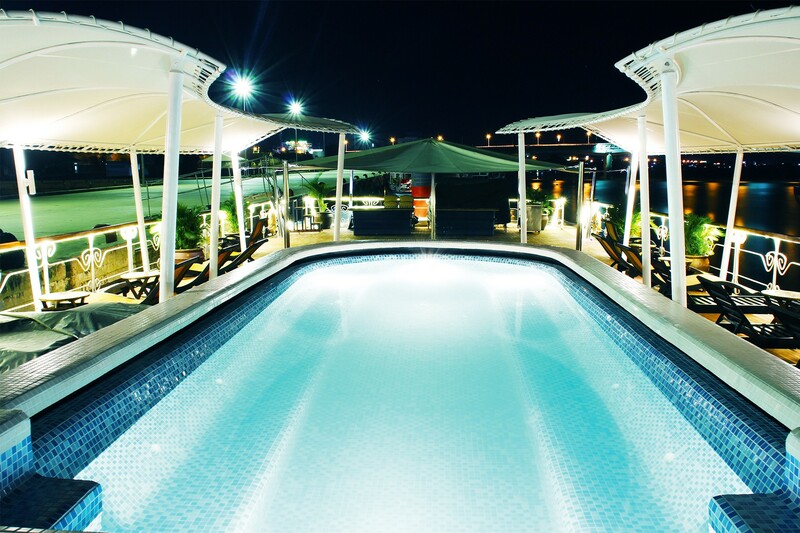 Take a rest on your cabin balcony or the lounge and get prepared for an exciting evening event. The evening starts with a variety of cocktails served on the Sundeck. In late afternoon, we will be captivated by a comprehensive lecture on Cambodia’s modern history. BBQ dinner is served right after the lecture. Take a seat and enjoy the Apsara dance performance. Experience the brilliance and richness of this culture, the soothing sounds of traditional music, the calming scent of incense sticks and a barbeque on the Sundeck. It is indeed a truly marvellous experience, dining in the open with the moon and the starts as our companions. Breakfast, lunch and dinner are included. Overnight in Phnom Penh. The Tonle Sap (The Great Lake) is the flowing heart of Cambodia, giving love and life to this nation. The Tonle Sap has more fish than any other lake in the world and is home to an incredible variety of birds, including rare – and endangered – feathered life. This great lake dominates Cambodia and is the largest freshwater lake in Asia with abundant birdlife. This lake is so wide that one cannot see its shores from the middle of the lake. Enjoy the stillness of the water and the quiet tranquillity on the way to Siem Reap. The water level varies a great deal according to the time of the year and the amount of rainfall recorded. Thus, minor changes to the itinerary may occur during different seasons. Our Heritage Line cruise liner comes to an end as we reach this city of the fabled Angkor temple complex. We bid farewell to the cruise as our journey comes to an end. But the memories and the friendships made on board linger on for a lot longer. 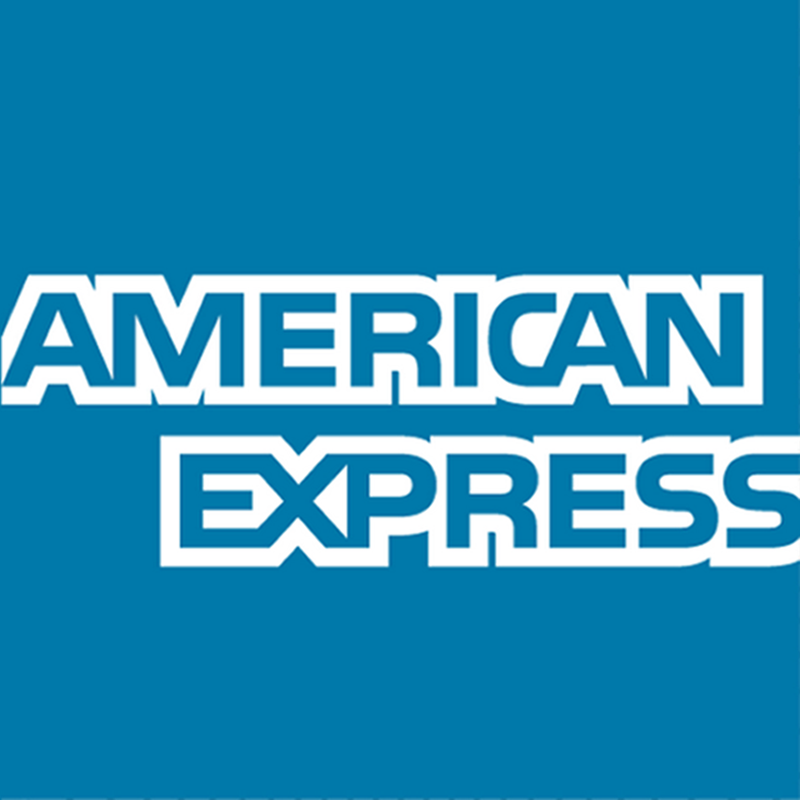 We will cross the Tonle Lake at dawn and at 09:00am, we will disembark at the Siem Reap Port for onward coach transfer to the drop off point in town. Breakfast is included. 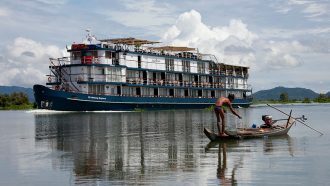 This is the classic Mekong river cruise, The Lost Civilization combines places rarely visited with opulent world heritage sites. 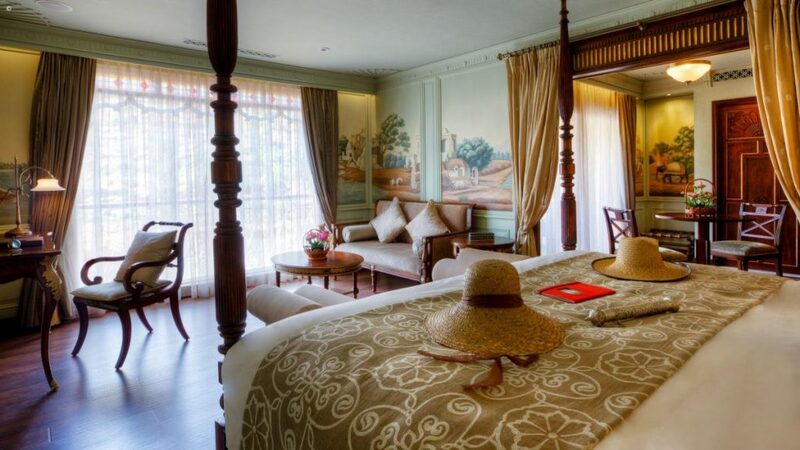 7 nights Saigon – Siem Reap (or vice versa*). 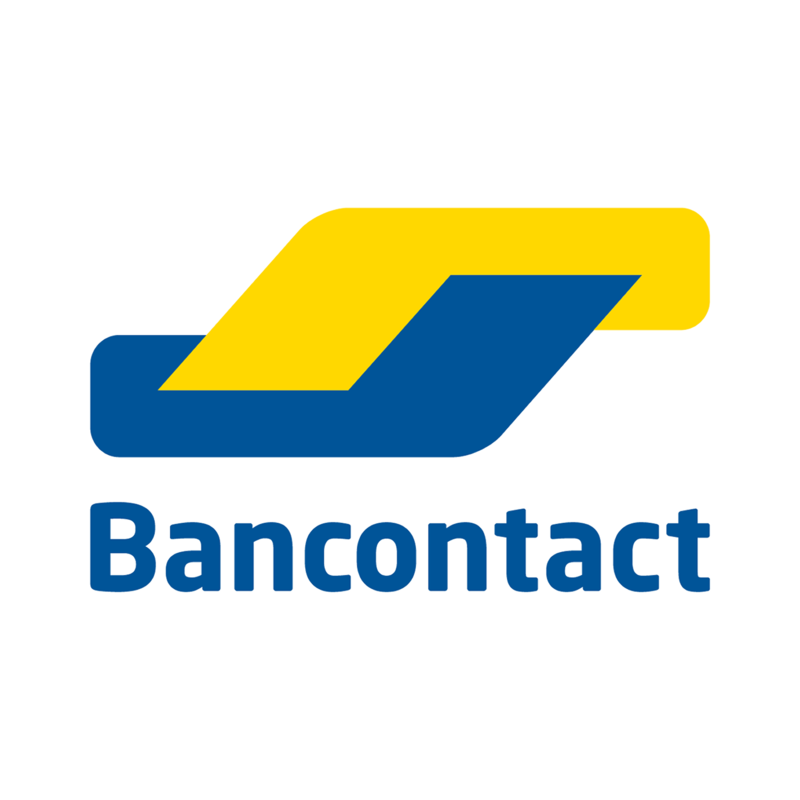 *Upstream and Downstream itineraries available – this indicates the direction the ship will travel. Downstream means from Siem Reap to Saigon. Upstream is the opposite direction from Saigon to Siem Reap. The majestic Jayavarman is considered the father in Heritage Line’s “family” of cruise ships. This vessel was named after Angkor’s most venerated king, a devout Buddhist who ruled from 1181 to 1218. King Jayavarman oversaw the construction of some of the most famous temples in Angkor, including Ta Prohm, Preah Khan and the unforgettable Bayon. Inspired by the serenity and artistry associated with this great Khmer monarch, Jayavarman’s design was also influenced by the French cruise liner Normandie, which launched in 1935. 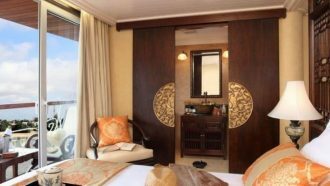 Travelling the Mekong between My Tho (the commercial port near Ho Chi Minh City) and Siem Reap, Cambodia, Jayavarman marries the art deco charm of 1930’s France with the romance of Indochina. Measuring 57.8 meters/190 feet from bow to stern, Jayavarman holds 27 elegantly decorated cabins. Thanks to its intricate woodcarvings, Khmer bas-reliefs and Vietnamese lacquer paintings, this impressive cruise ship resembles a floating art gallery. Wherever they look, guests are reminded of the local arts and culture. With three-and-a-half decks, Jayavarman is as spacious as it is beautiful. Guests can admire Khmer artefacts in the Henry Mouhot Lounge, mingle in the Club 1930 Bar, dine in the elegant Indochine Dining Hall, and recharge with spa treatments in the Apsara Spa. 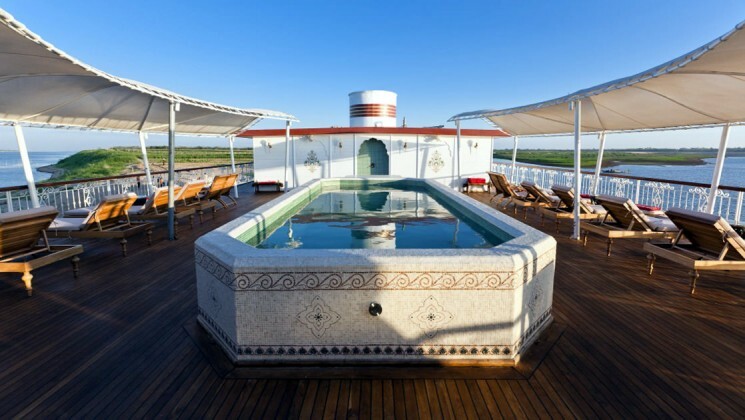 A Jacuzzi pool is located on the top sun deck, which offers spectacular views of the passing delta. Along with its peaceful beauty, the Mekong Delta is known for its friendly locals. The crew members of Jayavarman are no exception. From the moment they board, guests are made to feel at home. Offering exceptional service, comfort and style, Jayavarman is a name to remember. 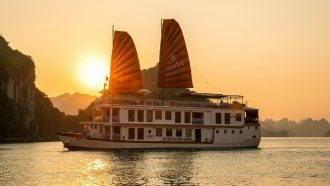 This beautiful vessel is an unforgettable means of exploring some of the finest scenery in Asia. 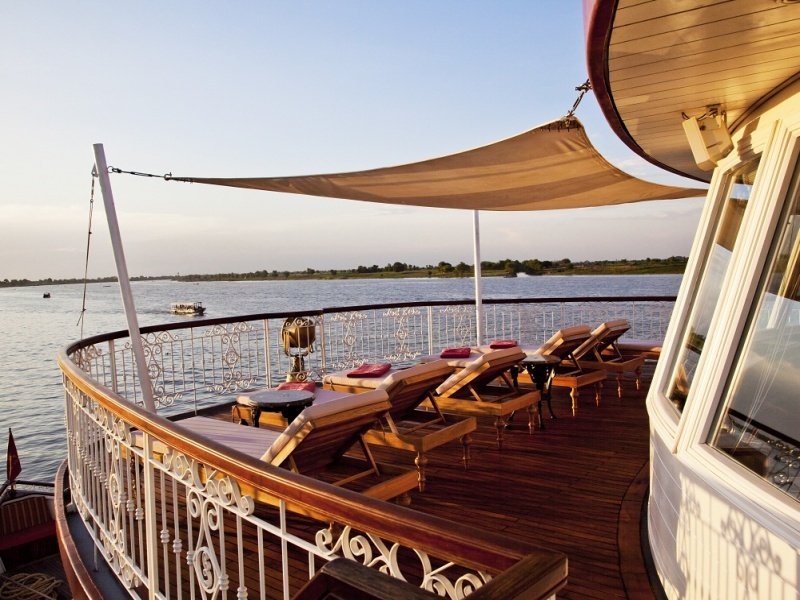 Before noon you board the luxurious Anawrahta, berthed at the quay of Mandalay’s riverside. 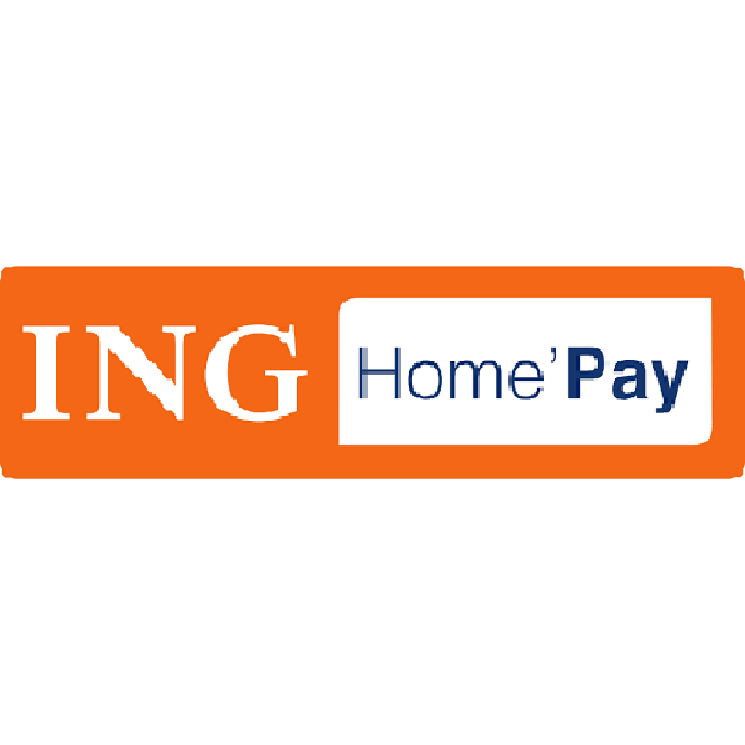 After a friendly welcome by our staff offering some refreshments you move into your “home” for the next days. The ship sets sail towards Sagaing, one of the ancient capitals of Myanmar. Please find your way to the restaurant “Hinta Hall” for lunchtime. After feel free to enjoy your time at the open air Kipling’s Bar or on the sun deck while Anawrahta is approaching Saigaing. We disembark for a wonderful discovery of some very highlights of Sagaing and the former royal capital of Ava. We cross the well-known 16 span cantilever “Ava bridge”, built in 1934 by the British, which connects the two old capitals. Ava (also called Innwa) was the metropolis of the Burmese kingdoms between the 14th to 19th century. By horse-drawn carriage we explore this area, sprinkled with many kinds of distinguished ancient monasteries and fanes: Bagaya Kyaung a jaw dropping teak monastery built in 1834, which nowadays continues to be a monastic school; Maha Aung Mye Bonzan Monastery or the Nanmyint watch tower come both in a different art and creation. It is the peace of Ava which you by then hopefully absorb during a laidback picnic teatime at a secret place in the middle of this sacred spot on earth. Back on board, we learn more about some of the long-lasting traditions (Longyi and Thanaka demonstration). A fascinating presentation about the history and culture of Myanmar follows afterwards. Before your first dinner onboard you are warmly invited by our cruise manager to a cocktail gathering at Kipling’s Bar. For early morning risers there is a special opportunity to participate at a yoga session on the sun deck. Strengthen your muscles and ease your mind by merging with the Ayeyarwady and its therapeutical flow downstream. Our next stop is Yanderbo. After the breakfast, a lecture about Bagan’s history is offered at the Mandalay Lounge. We have some cruising relaxation time during the morning. Gaze on the river banks of this eternal stream from your bench on the sun deck or alternatively, a spa treatment would have the same recreation effects. After lunch on board the ship arrives at the quiet, small riverside village of Yanderbo. An unique and fascinating gem of a village where in 1826 the King of Ava signed the Treaty of Yanderbo, signalling the end of the First Anglo-Burmese war. Nowadays the villagers produce a type of water pot which is reputed to keep water cooler than pots from anywhere else in the country. 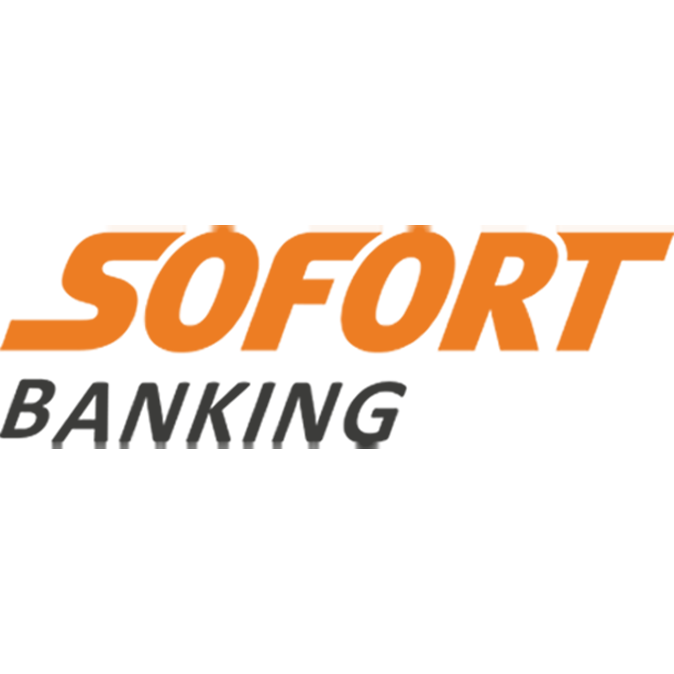 Anawrahta’s broad-knowledge guides will offer you the explanation to that. On foot we explore the village. You quickly notice that the villagers here are extremely friendly, charming and open for chitchats. You will definitely take back home some enchanting memories. Their techniques and skills to produce a variety of pots and utensils are perplexing. Try yourself to work on one of these pots. We return to the ship for the afternoon high tea. As we sail on to the next overnight spot Pakokku, we pass the confluence of the Ayeyarwady and it’s greatest tributary, Chindwin River. As the evening approaches and the Burmese sun immerse everything in a golden light a special event will take place at the Kipling’s Bar. Dress up in style as we send “A toast to the past” during a British club where gents may whiff cigars and ladies sip on tasty gins with tonic. Share some tales of the old (British-Burmese) days. Isn’t sometimes the time to lose time. Adjacent dinner is served at the Hintha Hall. If you feel like it you can join our open air cinema under the stars on the sun deck showing classic movies (depends on weather conditions). In the morning our yoga class will help to get in the right form for another day of great explorations. 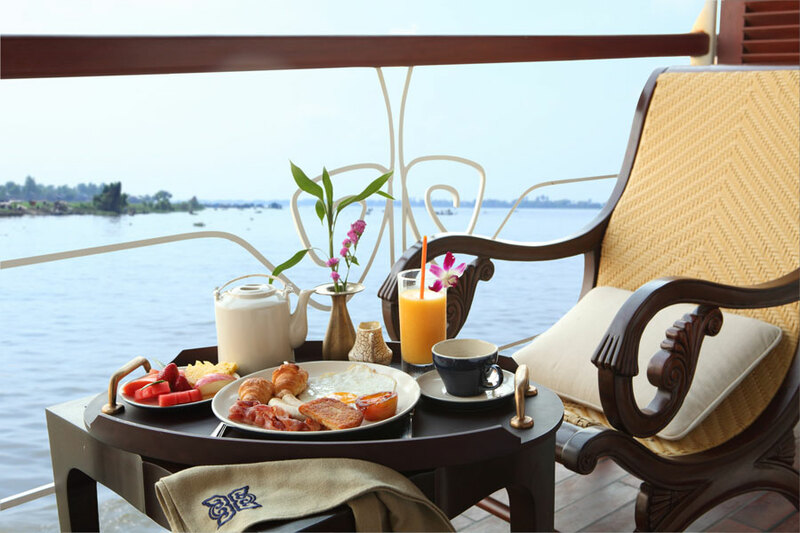 Enjoy a leisurely breakfast as the ship sails some more miles southwards before we arrive in Pakkoku. 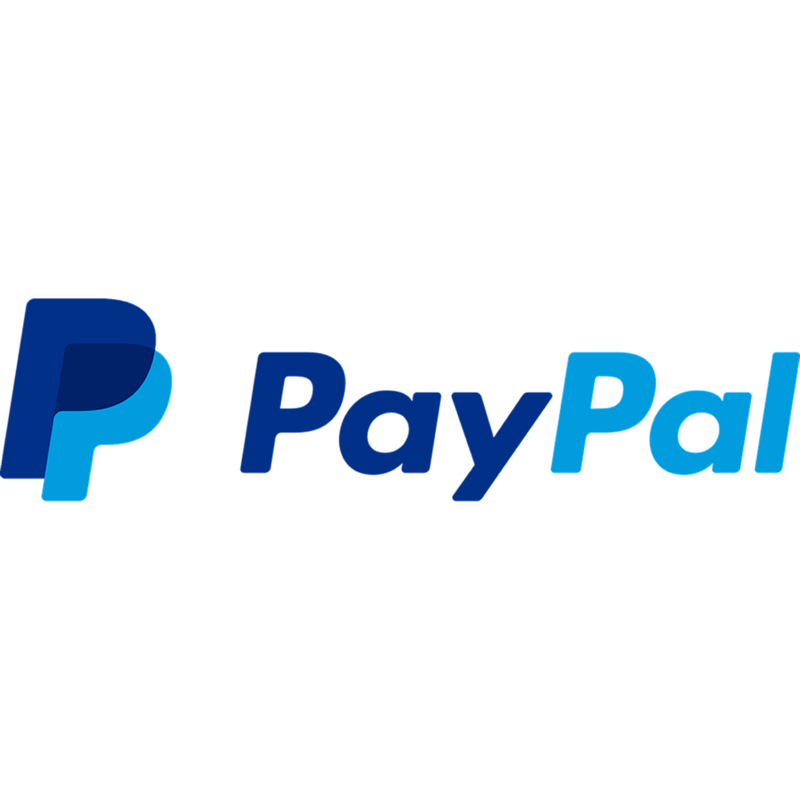 Pakkoku is an old trading town on the western riverbank of the Ayeyarwady. Right before the arrival you see the longest bridge of Myanmar (Pakokku Bridge). On shore the tour takes us to some of the small industries in this area, such as a cheroot-rolling factory and a producer of ‘Burmese slippers’ (“flip-flops”). Local handicraft vendors try to make their living with it. A visit of the thriving market gives us an insight of local goods and trading practices. Pakokku is also well known for the production of Tobacco. If you like to buy some Burmese cigars, this is the place. We continue touring to the Shwegu Temple. This temple features incredible, intricate carvings made from rare Yamanei wood. It also houses a unique Buddha image seated on a lotus throne. Back on board lunch is served and Anawrahta continues her journey southwards, eventually arriving at the utmost highlight of this journey - Bagan. The ship will dock at Bagan at the early afternoon (approx. 2PM). At this time we bid farewell to our guests of the 3-day/2-night cruise. In the afternoon a magnificent temple serendipity starts. There are over 2000 temples, stupas and pagodas in an area of just 30 square kilometers. We explore the most remarkable ones, like the Ananda Temple or the pretty Sulamani Pagoda. As the final blow off during dusk we are going to enjoy a breathtaking vista from a pagoda “summit” to marvel at the temple strewn plains. We wistfully return to the boat. After some refreshing time and before dinner you are invited to watch a traditional Bagan dance performance at the Mandalay Lounge. After dinner our nightly open air cinema is offering another classic movie on the sun deck (depends on weather conditions). In the morning we provide an once-in-a lifetime opportunity to sign up for a sunrise balloon flight over the Bagan area (on extra cost, pre-booking required, subject to season). After breakfast we say good-bye to our guests of the 4-day/3-night cruise. The morning tour starts with a visit of the bustling Nyaung-U market. This is a truly Burmese market where everything is offered. The tour around the market provides best photo-moments of local life and people. After the market we visit the revered Shwezigon Pagoda. This prototype of Burmese stupas consists of a circular gold leaf-gilded stupa surrounded by many smaller temples and shrines. We make a stop at a lacquerware workshop. This is a must-see of a long standing, fascinating craftsmanship. We complete the varied morning tour with a look on the fine frescoes inside the Wetkyi-In Gubyaukgyi Pagoda before returning to the ship for lunch time. The afternoon holds two options in readiness. The first is a visit to the sacred Mount Popa monastery which sits picturesquely on an extinct volcano (some mobility and fitness is required to reach the top). The place is believed by the Burmese to be home to their animist spirits - the Nats. The trip stops en route at an enjoyable palm sugar plantation where we can look over the shoulders of a typical local candies manufacturer. The second option includes an exploration of Myinkaba Village. You visit the Manuha Pagoda, dating from 1059 where King Anawrahta imprisoned the Mon King, Manuha. A short distance is the beautiful architecture of the Gubyaukyi temple. Take some individual time to explore the village of Minnanthu on your own pace afterwards. Back on board and after some refreshing time, Dinner is served. Afterwards the crew is happy to invite you to some farewell entertainment in the lounge. After breakfast your stay on your floating, luxury home regrettably ends. Heritage Line and the Anawrahta crew wish you a wonderful onward journey in the land of Ancient Capitals - Myanmar. Myanmar can be described as a picture-postcard land of elaborate pagodas, one-legged fisherman, ever so friendly people and a rich cultural history. But the storied Burma of Kipling, Orwell and the Romanticism of the Colonial period, is transitioning from decades of isolation and is now poised to be on the forefront of tourism. This “Golden Land” so nick-named after the light reflecting off the myriad number of golden temples caste a warm enveloping glow over the country. There is additional “sparkle’ from the wealth of minerals and rare-earth metals so prized in today’s technologies. But the warmest glow comes from smiles of the people. There is an extraordinary timeless quality to Myanmar’s Irrawaddy River, also known as the Ayeyarwady. Rising among Himalayan glaciers and flowing freely for almost 2,200 km across the whole country into the Indian Ocean, this river is a witness of contemporary history. The kings of medieval Bagan would almost certainly recognise its riverbank life today with its bullock cart or the tiered pagodas atop rambling teak monasteries. Please note: 4 day & 3 day long itineraries are available. Please contact us for more details. Please Note: More Myanmar voyages are available, not all of them are listed online. Please contact us for more details. 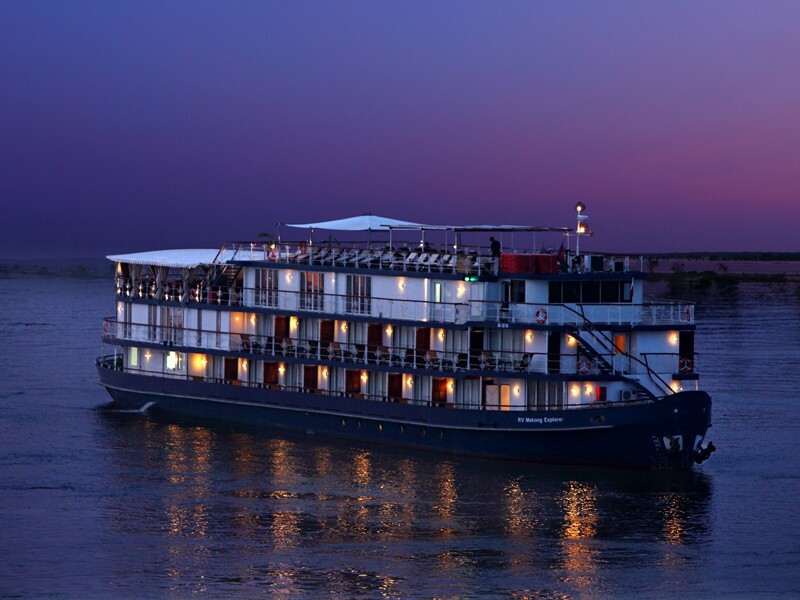 With the largest cabin space on the Ayeyarwady river, and the highest crew to passenger ratio, Anawrahta offers the finest on-board experience in Myanmar. This impressive vessel is named after the founder of the Burmese nation, the modern day Myanmar. During his reign, from 1044-1077, he introduced and spread the religion of Theravada Buddhism throughout the land. Set on the Terrace Deck, the Kipling’s Bar is the perfect place to watch the world slip by as you enjoy your favourite wine or cocktail. With its high ceilings, large windows and colonial-style rattan chairs, the Kipling’s Bar invites guests to relax and contemplate the passing river life. With colours inspired by local spices, the Kipling’s Bar is a spacious 157-square meters/ 1,690-square feet. With polished wood floors, comfortable rattan chairs and traditional Burmese decorations, the 162-square meter/ 1,744-square feet Mandalay Lounge has the relaxed feel of a colonial club, at once exclusive and welcoming. Lean back against the burnt-orange cushions and enjoy a good book, or join friends for a nightcap in the lounge’s elegant and exotic ambiance. This elegant venue is located on the Upper Deck. Inspired by the lavish decorations of old Bagan and Mandalay, Anawrahta’s Hintha Hall Restaurant evokes the elegant dining halls of yesteryear. White tablecloths and gleaming glassware are surrounded by polished wood, intricately-carved floor and ceiling panels and – last but not least – stunning views, framed by large picture windows. With seating for 48, the 141-square meter/ 1,518-square feet Hintha Hall lies on the Terrace Deck. Anawrahta is especially proud of its spa, which offers expert service, locally-inspired treatments and beautiful surroundings. Inspired by Mandalay’s White Hsinbyume Pagoda, the Thazin Spa features three massage beds, mani-pedi stations and a steam bath. Superbly trained staff and inspiring views make this the ultimate place to unwind. Local flavours. Fresh, diverse and delicious As well as offering international favourites, Anawrahta’s chefs take great pride in introducing their guests to the authentic flavours of Burma. Influenced by the cuisines of China, Thailand and India, Burmese food is as diverse as it is delectable. Thanks to its long coastline, seafood plays a prominent role, as do fresh herbs, aromatic spices and both highland and lowland vegetables. A typical Burmese meal involves steamed rice, a fish or meat curry and a light soup. Salads, known as a thoke, are plentiful, as are imaginative condiments. Last but not least, the nation’s Buddhist culture has given rise to mouth-watering vegetarian options. Discover the mysterious and captivating ancient continent of Asia with its history, traditions and many vestiges. Sail along the coastline of Japan, “Land of the Rising Sun”. This is a very interesting cruising itinerary, where Japan will open its doors to you. The Japanese archipelago is well known for its blend of traditions and modernity. More south, you can immerse yourself in the rich culture of Buddhism in tropical Vietnam and Cambodia. Stroll by the low-lying plain, rice fields and temples with forested mountains on the background. Enjoy the land with its people waiting for you behind the immense coastline, with its lagoon villages and long waterways. The islands of Indonesia are also worthwhile to cruise through. Here you find diverse landscapes with coastal villages, remote beaches, jungle and mountains. 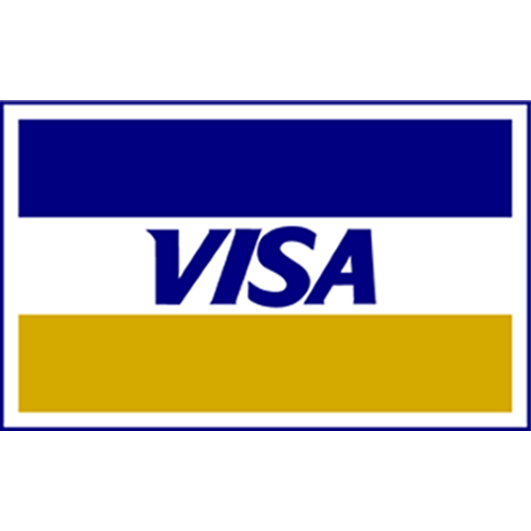 Indonesia is very intriguing to visit and become acquainted with. An enormous archipelago, full of flavour and spices!